It was 2013, and most brands were throwing money and product at Mommy Bloggers in hopes that a blog post would drive sales. This cycle occurred with every product launch, and it continues today with many brands. However, an email from the Chick-fil-A innovation center transformed the way this brand worked with moms, and it led to priceless success generating conversation about the brand in homes across America. 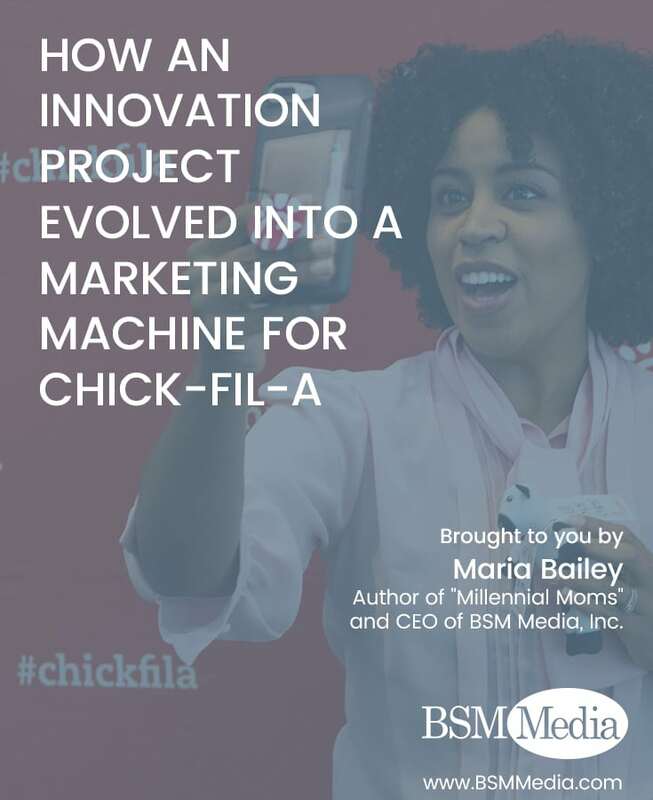 Today, I reveal the story about how Chick-fil-A’s Mom Panel turned from an innovation project into a marketing machine. As the CEO of BSM Media and the author of 6 books on Marketing to Moms including “Trillion Dollar Moms” and “Power Moms”, I’m used to calls from CMOs and marketing agencies seeking to connect with influential mom bloggers. What I wasn’t accustomed to was receiving emails from innovation teams. The email from Chick-fil-A five years ago sparked a journey that connected the brand with moms more than ever before. What started as a simple focus group has turned into a marketing machine for the chicken giant. In the beginning, we worked with Chick-fil-A through what we called Kitchen Counter Conversations that engaged mom focus groups to provide insight and feedback to improve menus, play areas, and other elements of the Chick-fil-A experience that affected moms and their families. Eight months into the project, Chick-fil-A recognized that the value of these moms could be increased. Thus, the Chick-fil-A Mom Panel was born. This started as a group of 100 moms from across the U.S. who were eager to share their thoughts and opinions with Chick-fil-A. These moms were different because they weren’t all bloggers: they were good old-fashioned genuine moms who were homeroom mothers, business owners, troop leaders, and meal decision-makers who were socially active both on and offline. More than all, they were passionate about the brand. Chick-fil-A realized that word-of-mouth marketing among moms existed long before social media, and the brand made the bold choice to capture this important phenomenon in homes all across America. Chick-fil-A recognized the power of a mom’s influence. For nearly two years, the Chick-fil-A moms quietly existed within the innovation center while the number of moms and the enthusiasm for Chick-fil-A moms grew exponentially. Our group proudly told friends and followers about their participation in the panel, volunteered to help local store operators with marketing initiatives, and posted their Chick-fil-A moments on social media. Each year was highlighted with a live webinar that allowed them to provide input on future kid’s meal prizes. All the while, Chick-fil-A gathered their insights and opinions about products and distributed these mom trends throughout the company, from corporate teams to the local operator. The relationship with the Mom Panel was on its way to creating massive influence. Today, the Chick-fil-A Mom Panel is 1,053 moms strong and is doing more than co-creating kid’s meals or play areas. In 2017, 10,000 moms submitted applications, which now limits its membership to 1,000. Moms were selected based on their alignment with the brand, their established network of influence with other moms, and their demonstrated love for Chick-fil-A. The typical Chick-fil-A Mom panelist averages 17,000 Twitter followers, 13,000 Instagram followers, and 16,000 Facebook friends- numbers that most brands pay top dollar to purchase for Influencer campaigns. Although more than 350 of the moms are online content publishers, their offline influence extends into their communities. More than 250 of the moms are involved in their local PTOs, over 330 are teachers, and over 230 are church leaders, which means they are interacting with and influencing a lot of meal planning moms. In 2017, the Chick-fil-A Mom Panel generated over 70 million impressions online through over 9,000 Instagram photos and 60,000 Facebook comments. Their social media engagement exceeds industry standards by more than 20%. This impressive response can be seen through the Chick-fil-A Mom Panel hashtag, #ChickfilAMoms, now used by local Chick-fil-A Operators, Chick-fil-A fans across the country, and the national office Support Center, who have all caught onto the power of the #ChickfilAMoms. This month, a small group of the panelists were invited to the Chick-fil-A Support Center for a day of learning, sharing, and touring. The moms received a first-hand view of new initiatives, a backstage tour, and interacted with members of the Cathy family as they tweeted, posted, and shared their experience. The influence created through the Chick-Fil-A Mom Panel serves Chick-fil-A’s local stores and overall brand with unmatched impact down to the root of Chick-fil-A’s customer base, the American mom. What did all of this cost? The short answer is less than a 30 second YouTube video by a macro-influencer, a 60-second television spot, or a single ad in People Magazine. The Chick-fil-A Mom Panel is a prime example of the benefits a brand receives when engaging with its best customers in an authentic way. Not only did the brand see a reduction in research expenses and avoided mishaps in products or services, but they also earned the trust and loyalty of thousands of raving mom fans. In our book, that’s priceless. BSM Media has created similar consumer communities for HP, Coppertone Water Babies, Children’s Claritin, Disney, Leap Frog, Medtronic and Papa Murphy’s. For more questions or more information, please email Laura@bsmmedia.com.